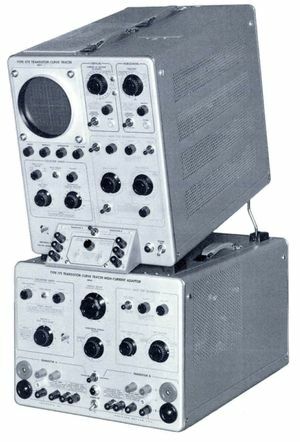 The Tektronix 575 is a curve tracer for transistors, introduced in March 1957. It can be thought of as being composed of three modules: an X-Y display, a step source, and a collector sweep source. (W/L/H) 13" × 24" × 16¾"
While I was working on the 540 series vertical amplifier, Virgil Briton, whose bench was next to me, had put together a vacuum tube curve tracer using stepping relays and other mechanical devices. I remember thinking that, that was a neat display even if it did a lot clicking and was slow. After putting the cross hatch generator together, I knew it would be very easy to do the curve tracer electronically,it started for in house use,but after putting a self-contained instrument together, Tek decided to call it 575 and sell it. The vertical and horizontal amplifiers are very similar, using the two halves of a 6CG7 dual-triode tube as the output amplifier. The CRT has −1700 V on the cathode and +2500 V on the anode. The HV power supply uses two 5642 rectifier tubes. It is possible to use the 575 as an X-Y monitor. The vertical and horizontal range switches have settings for external input, at 0.1 V/div sensitivity. This uses a gated Miller integrator to generate controlled steps. The result is a staircase waveform, which generates different traces in the family of I-V curves of the transistor. A main power supply around T601 (120-095 and, later, 120-0095-01), supplying power to the amplifiers and step generator in the 575. This power supply follows the standard 500-series power supply design. In addition to heater power, it provides −150 V, +100 V, +300 V regulated and +400 V unregulated output. It uses a mix of tubes and silicon or selenium rectifiers (earlier S/N) for rectification. The −150 V and +400 V unregulated/+300 V regulated rails are supplied through 6BW4 full wave rectifier tubes, the +100 V circuits through silicon diodes/selenium rectifiers. The −150 V rail is the main reference supply. Its regulator uses a 5651 voltage reference, a 6AN8 as the comparator/error amplifier, and a 12B4 as series pass tube. The +100 V regulator uses a 6080 series pass tube and a 6AU6 tube as the error amplifier. The +300 V regulator is similar to the +100 V circuit, except that it uses a 12B4 series pass tube. Unregulated +400 V is provided for the CRT HV Oscillator. A high-voltage supply around T801, supplying the CRT voltages, +2300 V for the CRT anode and −1700 V for the CRT cathode. This HV power supply uses a 6AQ5 as the HV oscillator tube, and a 12AU7 as the feedback/error amplifier. A collector sweep supply for the device under test. Power from the mains goes through an isolation transformer (T701) and a variac (T702) and is rectified by germanium diodes to produce the collector sweep voltage. The isolation transformer has two pairs of secondary taps, one for high voltage (0 to 200 V) and low current, the other for low voltage (0 to 20 V) and high current. The maximum power that can be delivered to the transistor in either mode is approximately 200 Watts. 575s with Mod 122C offer extended collector sweep voltage to 400 V.
Early 575 versions used selenium rectifiers. A kit for conversion to silicon diodes was available and is documented in the back of the manual. The 575 uses the Tektronix T0520 CRT. The 575 has a thermal cutoff. The 575 can be paired with a 175 for high current device measurements. This page was last edited on 12 April 2019, at 05:50.